The San Francisco Bay Area is one of the most active salsa spots in the US, and it’s no surprise that there are a lot of great Bay Area salsa sites. Spanning roughly from San Francisco to San Jose, as well as surrounding areas such as the North Bay and Santa Cruz, there are many dance teams, instructors, and events that can be found in the Bay Area. This site is the home of the Couture Dance Alliance, a San Francisco-based salsa team directed by 2-time World Salsa Champion Luis Aguilar. Their website features a calendar of events, upcoming dance classes, and information about performances and auditions for the Couture Dance Alliance dance team. The homepage of Avance, a 13-piece salsa ensemble from the San Francisco Bay Area known for their sizzling sound a bi-lingual lyrics. You can find a gallery of photos, bios of band members, a schedule of performances, a selection of CDs, and more on their website. A website where you can find out about salsa lessons and classes going on in San Francisco and purchase tickets online through their website. The website of Garry Johnson and Viola Gonzales, two salsa instructors who teach in the San Francisco Bay Area. On their site you can find out about upcoming classes the two are teaching, sign up for private lessons, view photos, and contact Garry & Viola. The website of Isidro Corona and Ariel Lehaitre, a pro-level salsa competition couple from San Jose, California. On their site you can read their bios, see videos of past competitions, and find out about classes taught by them. 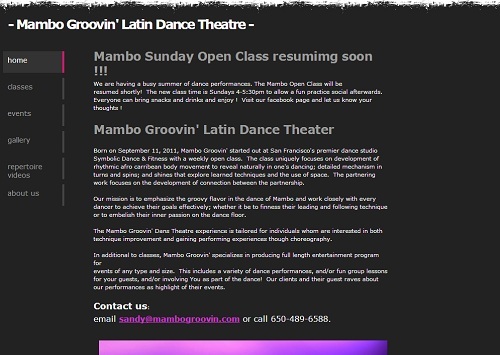 The website of John Narvaez and Liz Rojas, professional dance instructors and the directors of Salsamania. You can find their bios, and information about their classes and dance team on their site. The website of Jsmooth Salsa, and organization based in downtown San Jose that offers free salsa lessons. The site features a calendar of upcoming classes as well as profiles of its instructors. Jose Guaman Y Su Orquesta La Fuerza Gigante is a salsa band available to perform at special events such as weddings. This San Francisco Bay Area band regularly participates in festivals there and also provides accompaniment for singers. Booking information is available on their website. The website of Los Salseros de Stanford, a college salsa team at Stanford University, with information about upcoming events and information about their salsa performance team. The website of Jack Ian Lin, a salsa instructor based in San Francisco, California where you can find out information about upcoming classes taught by Jack and his co-instructor Tianne Frias, as well as read about Jack’s thoughts on salsa and dancing on his blog.